Knots of Love Stud Earrings Just $25.99! Down From $129.99! You are here: Home / Great Deals / Knots of Love Stud Earrings Just $25.99! Down From $129.99! Sears has this Knots of Love Stud Earrings on sale for $25.99 (Reg. $129.99)! These diamond earrings are a great gift to show someone how much they mean to you. 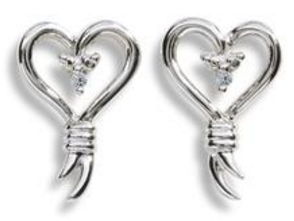 The heart-shaped design comes gorgeously prong set with diamond accents on sterling silver. The shimmer of stones against the high-polished silver creates a lovely well-rounded look that is neither too glitzy nor dull.